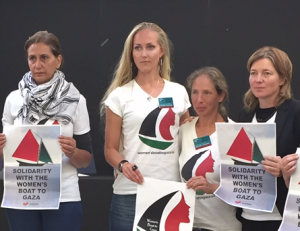 The Freedom Flotilla Coalition and Women’s Boat to Gaza organizers are deeply disappointed by the negative attitude of the plenary chairman, which is in complete contradiction with the democratic values which the European Parliament is supposed to promote and protect. We are grateful to those brave voices which continue to speak up in Strasbourg, Brussels and elsewhere for Palestinian human rights and against the illegal blockade of Gaza. MEP Malin Björk (right) with WBG participants Jaldía Abubakra, Ellen Huttu-Hanson and Zohar Chamberlain Regev, at the EU Parliament (Wednesday 5 October 2016).